We may also use the information we collect to occasionally notify you about important functionality changes to the Web site, new CasinoShop products and special offers we think you'll find valuable. We will at the very most e-mail you 6 times per year and each e-mail will contain an offer of some description. How does CasinoShop protect customer information? Will CasinoShop disclose the information it collects to outside parties? 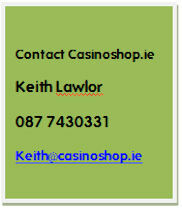 CasinoShop does not sell, trade or rent your personal information to others under any circumstances. CasinoShop may provide aggregate statistics about our customers, sales, traffic patterns and related site information to reputable third-party vendors, but these statistics will include no personally identifying information. We are committed to protecting your privacy. We use the information we collect on the site to make shopping at CasinoShop possible and to enhance your overall shopping experience. We do not sell, trade or rent your personal information to others. None of our customers has reported fraudulent use of a credit card as a result of purchases made with us. We are totally confident about the transaction security we offer on our site. Our backend databases which contain your personal information and payment details are also digitally encrypted so that any information downloaded will be completely useless to unauthorised persons. In the unlikely event of unauthorised use of your credit card, most banks and card issuers either cover all the charges or may limit your liability to just €50.00.